Ukrainian nationalists accused of having links to Nazi Germany have been legalized, praised as freedom fighters and granted social benefits in legislation signed by president Poroshenko as part of so-called ‘de-communisation’ package of laws. “The law provides for state recognition of the struggle for Ukrainian independence in the twentieth century and defines the legal status of participants in the struggle for Ukrainian independence in the twentieth century,” an explanatory note to the document reads. The Verkhovna Rada of Ukraine adopted a law on April 9 when some 271 MPs officially recognizes Ukrainian nationalists who actively collaborated with Nazis in the 20th century as “freedom fighters.” Members of several official paramilitary groups, including OUN and UPA, notorious for their bloody campaign in the 1940s are now granted social benefits by the new law. According to the bill, actions by such organizations are now rendered lawful, as their goals and methods “did not contradict” the United Nations Charter, the Universal Declaration of Human Rights or other international acts. Historians estimate the OUN – UPA are responsible for at least one million deaths, including a large number of Poles, Russians and Jews. The quest to present Ukrainian nationalists as heroes, who were not just fighting against the Soviet government but also bravely resisted the Nazi Germany invasion, has been in the making for over a decade. Initially proposed in 2005 by then President Victor Yushchenko, the initiative struggled to gain much public support. Protests against recognition of Nazi collaborators were held across the country at that time. 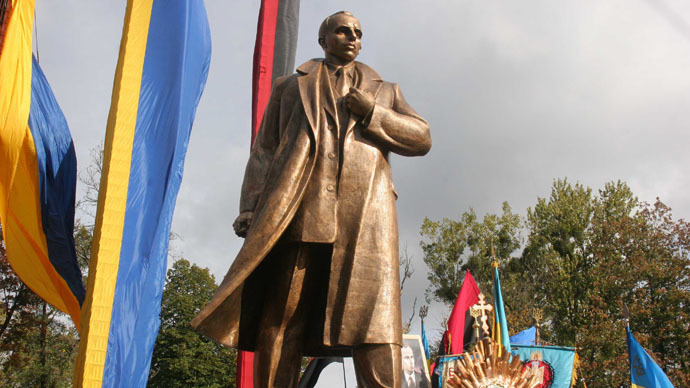 In 2010, Yushchenko did grant Stepan Bandera, the leader of OUN the posthumous title of Hero of Ukraine. A year later, the award was annulled after being widely condemned by European Parliament, Russian, Polish and Jewish organizations. The ‘de-communization’ package of laws signed by Poroshenko on Friday also included a legislation banning communist-era symbolic and propaganda, condemning Soviet government on par with German Nazi regime. He also signed laws that will see the release of Soviet-era KGB archives to public, and scrap the term Great Patriotic War from official use replacing it with World War II.